“It’s certainly unusual,” Officer Sean Wilkenfeld, a public information officer for the Oakland California Highway Patrol, told Breitbart News about the incident. “The CHP didn’t have any involvement in that incident. I reached out to the Oakland Police and Alameda County Sheriff’s Office and they didn’t confirm to me that the vehicle belonged to them,” Wilkenfeld said. The video was posted to YouTube by username “Viral Videos” and was captioned with the word “MOBBIN.” It has so far garnered close to 137,000 hits. The vehicle does appear to be either an unmarked patrol supervisor vehicle or belong to a federal agency. Breitbart News also spoke with the Oakland Police. One officer said: “I haven’t the slightest idea” who the black vehicle belonged to. Sergeant Ray Kelly, a public information officer with the Alameda County Sheriff’s Department, confirmed with Breitbart News that the vehicle did not belong to the Oakland PD or his department. He also provided a different perspective, suggesting the incident was not a high-speed chase, as many media outlets have been reporting. 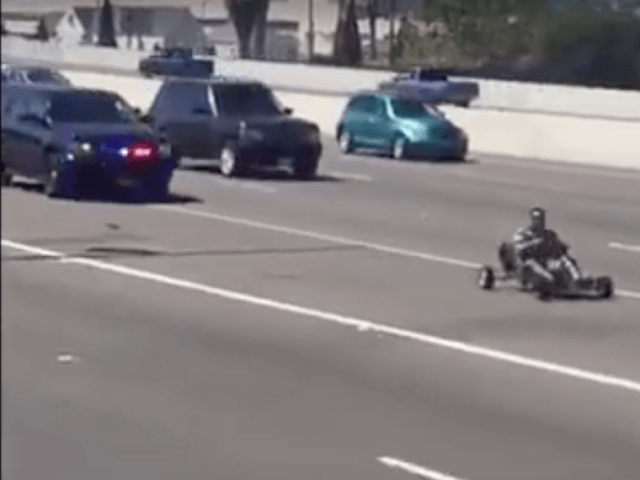 “Although it may look like a pursuit, the officers in the vehicle may have been protecting the go-kart driver from being killed on the highway by high-speed moving vehicles,” Kelly told Breitbart News. He explained that being the go-kart has low visibility, and it could easily be run into by a motorist. “That officer may have been doing public safety and not engaged in a pursuit,” he added.